The New MegaSceneryEarth Ohio V3 featuring unsurpassed image sharpness, scenery color and clarity, improved scenery features with accurate additional water bodies and topographical data and the latest aerial imagery available taken in 2017. 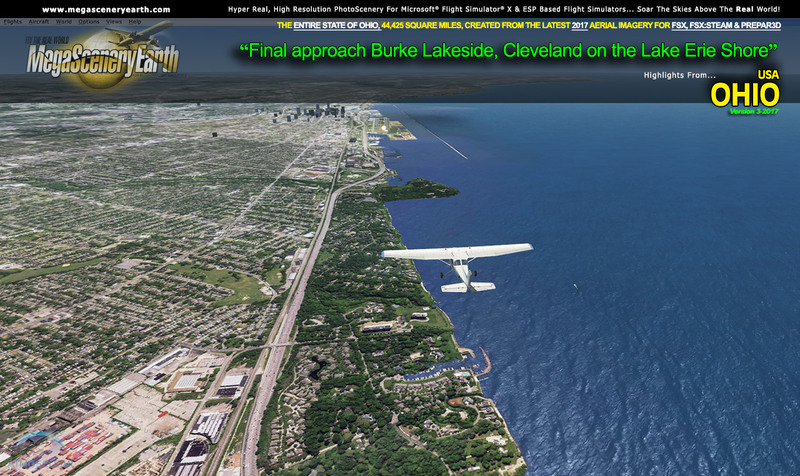 Fly the entire state - BORDER to BORDER - of Ohio in photoreal detail. Ohio is 44,825 square miles in size and has 554 airports. You'll see everything that you see in Ohio in real life in the scenery. This is a massive area. As an added bonus, we provide all the VFR and IFR charts in digital PDF format to enable you to get the most out of your scenery. This includes TACs and Sectionals, IFR enroute charts and 518 page book of Instrument Approach plates, Airport Diagrams, SIDs and STARs. The charts are downloadable along with your scenery files. Mountains: Campbell Hill (1,539 Feet), Mount Miserable, Bald Knob, Hulse Hill, Round Knob, Talston Knob, Sugarloaf, Chapel Hill and a total of 50 mountains above 1,200 feet. Click Here for more information, A FREE DEMO, or to order this title.